The number of medications prescribed by Canadian doctors is steadily rising. According to the global market research company, IMS Health, 522.4 million prescriptions were dispensed in Canadian retail pharmacies in 2011, representing a 4.8 per cent increase from 2010 and a whopping 32.8 per cent increase over 2006. The top three drug types were for heart disease, mental illness/mood disorders and gastrointestinal/genitourinary illnesses. When a systemic drug unintentionally reaches the cornea, lens and vitreous through the uveal and retinal circulations, it can cause unwanted secondary ocular effects. These can affect patient satisfaction with contact lens wear and the contact lens itself. Eyecare professionals should have a working knowledge of these drug-related effects in order to distinguish them from those caused by the contact lens itself or its improper use and care. Keep in mind not everyone who takes medication will experience side effects and not all side effects are undesirable, especially with medications that have multiple indications and/or have off-brand uses. In general, patients can experience many eye-related drug reactions, including corneal opacities and deposits, cataract, pigmentary retinopathy and optic neuropathy. Conjunctival hyperaemia, dry eye and mydriasis are examples of common conditions that may be wrongly attributed to contact lens wear. A careful review of the patient’s case history and medications (dosage, duration and the systemic condition being treated) at each follow-up visit is the key to clarifying the nature of any problems that arise. It also allows for better patient education, collaboration with other health care professionals, and healthier contact lens care. 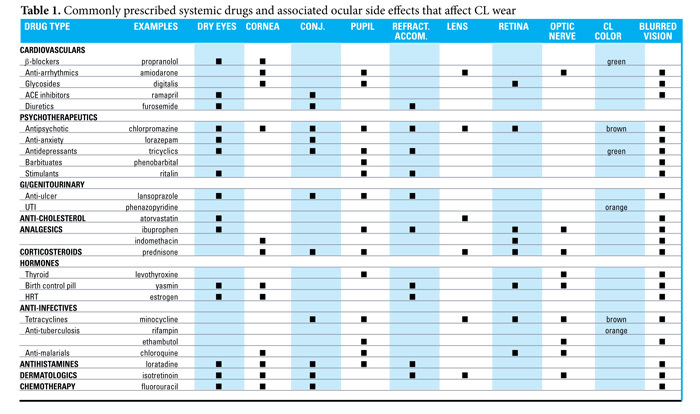 The following chart shows the relationship between several commonly prescribed medications and eye/vision conditions.